Clachtoll broch View towards entrance in outer wall leading to the broch entrance. Clachtoll broch Footings of wall founded on natural rock. Clachtoll broch. End of stair emerging at level of first gallery. 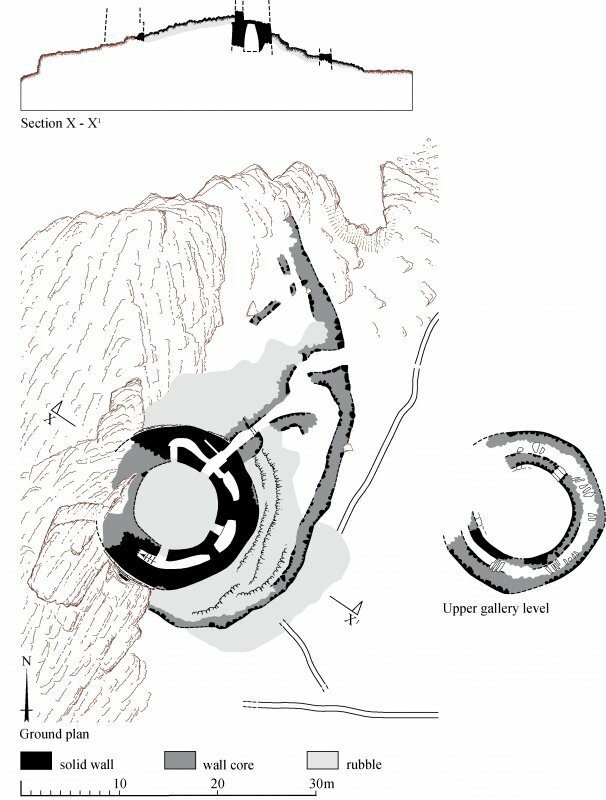 Clachtoll Broch, ground plan & section. 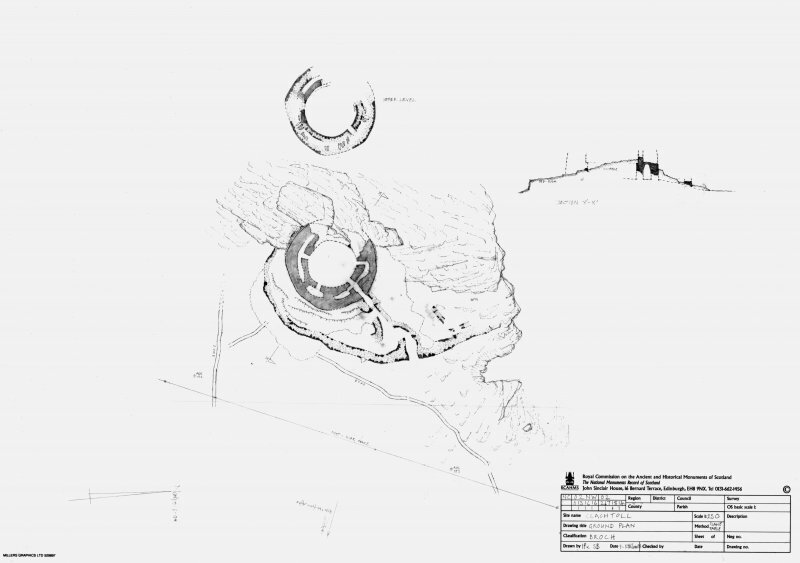 Clachtoll Broch, measured survey drawing including ground plan & section. About 100 yds from the broch are the much ruined remains of a massive outer wall crossing the uncultivated land to the E: the land to the S being all cultivated, the outworks in that direction have been demolished. 40' from the broch is another wall built of great stones, 2' - 3' in height and some 6' thick, which leads from either side of the entrance and was evidently carried round to out- flank the building. On the S the details are still evident. At the turning it enclosed a mound of stone and earth c. 8' across faced with building on the inner side. The distance between the stone uprights of the gateway through the wall is 6'. The broch is defended by an outwork built of very large blocks and boulders, but another ruined wall lying some 100 yds away is most probably a land boundary of later date. 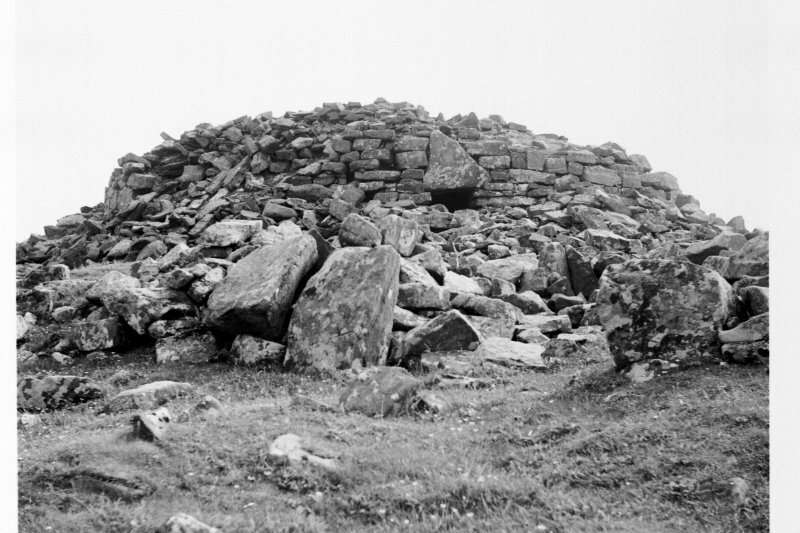 This broch measures 16.1m in overall diameter. The internal diameter can only be measured above the rubble which fills the interior to above scarcement level. Here it is 9.7m, and the wall varies between 3.1m and 3.4m in width, but at ground level at the entrance the wall is 4.2m thick, suggesting an internal diameter of about 8.0m. The entrance passage is accessible and shows two upright slabs for door jambs 1.7m along it. Behind them are the bar holes and the entrances to two guard chambers each 3.7m long. There is an opening into the broch interior from the rear of the N guard chamber. There is what may be a later forework immediately in front of the broch entrance, and traces of a probably secondary building, both of which are mainly masked by debris. The entrance passage through the outwork shows two upright blocks, probably jambs, about 4.0m along it, and there are suggestions that a passage or corridor led on from them towards the broch entrance, but debris prevents a true assessment of this. The alleged outwork 100 yds distant is a combination of outcrop and cleared stones. Visited by OS (G H P) 11 May 196 and (A A) 5 August 1974. Visited by OS (J B) 14 August 1980. This site was visited in the course of fieldwork by Dr. T.C. Welsh in 1971. For further information, see MS/576/1. The broch is built on a rocky knoll right on the edge of the sea and still looks impressive, though part of the wall has now fallen over the low cliff. The broch has not been cleared out and the interior is full of stones which hide most of the inner wallface, but much of the outer wall can be seen. On the east side there is an outwork, a stone wall running obliquely some 5m-18m from the broch, with an entrance passage through it. This outer wall goes round the south side of the broch and runs out to the cliff at each end. Between the outer wall and the broch there is now a confused mass of rubble, but originally there would have been stone huts with a path between them leading to the broch entrance. The inner end of this path seems to have been a lined and roofed passage, as at Carn Liath (no. 90), but modern walls have been built in this area which confuse the ancient features. The broch entrance has a massive triangular lintel diverting the weight of the wall above. The entrance passage is partly filled with rubble, but it is possible to crawl in and see first the door checks with a bar-hole beyond to the right, and then openings to small chambers on either side. Opposite the entrance, on the other side of the broch, the remains of a gallery can the traced in the wall. 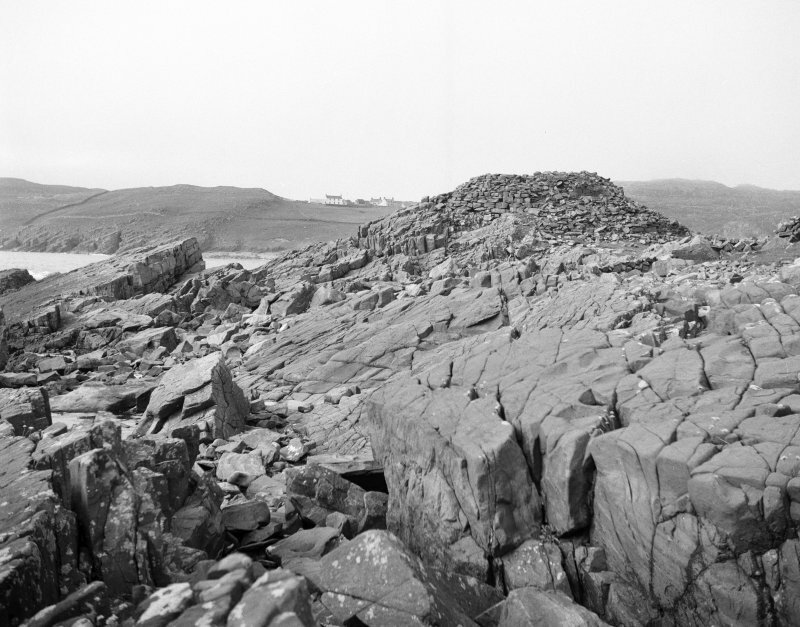 This broch, possibly ground-galleried,in Assynt, Sutherland, stands on a low rocky knoll just above the flat rocks fringing the shore at the south end of the Bay of Stoer. It is in a fairly good state of preservation except towards the sea where a segment of the wall has vanished, presumably having been washed down the sloping rock of the foreshore (visited 10/9/84, 28/6/88,in August 2001 and July 2005). It is clear from the plan that this was a complete broch and not a D-shaped structure. The wall was somewhat thicker along the seaward side where the large segment has disappeared, a fact which is doubtless to be explained by the relatively smooth, sloping rock surface here. The base of the outer face must have descended as it crossed this rock and would have to have been built further out. The interior of the broch is full of debris, the inner wallface standing up to 90cm (3ft) above the rubble and 90cm -1.2m above the top of the outer wallface, itself standing in places 1.8-2.1m (6-7ft) high. Some indication of how well this broch is preserved is gained from the height of the scarcement which is exposed at the two broken ends of the inner wallface – at 1 o’clock and 4 o’clock; elsewhere the ledge is hidden under rubble. The ledge at the latter position is at exactly the same height as the lintels covering the central part of the entrance (it is slightly lower at 1 o’clock). The schematic cross section shows how most of the wall is below this ledge but how parts of it are higher; this Level I of Clachtoll is well preserved and Level II above it is preserved up to 60-90cmin places. The highest part of the wall could be about 3.5m (11.4ft) above the rock. The internal diameter is about 9.6m (32ft)  and the central court has a radius (above the scarcement) of 4.78 +/- 0.08 m. Allowing for the width of the ledge the internal diameter at ground level should be about 10.2m (33.4ft). The main entrance is on the north-east (not on the east ) and is blocked at its inner end; there is a massive triangular lintel over the outer end of the entrance which measures 1.35m (4.5ft) long, 1.17m (3ft 10in) high and 30cm (1ft) thick. The passage has evidently been further emptied of debris since 1909 and the chamber over the entrance is now clearly visible; its walls seem continuous so no upper gallery connected with it. The passage below can be seen through a gap in the lintels forming the floor of this chamber. The door-frame is 1.50m (5ft) from the exterior and is formed of two recessed checks faced with upright slabs. Immediately inside these are a deep bar-hole on the right and a shallower bar socket opposite on the left; the drawbar was probably about 1.2m above the original floor of the passage. This passage, 1.0m wide at the outer end, widens to 1.20m (3ft 11in) after the checks, expanding further inwards to 1.26m (4ft 2in) at the opposed doors to the intra-mural spaces. The right door leads to a guard cell which follows the curve of the wall for 3.95m (13ft) and has a partly corbelled roof; this is capped with lintels which rise up like steps from either end to the highest point in the middle, to a height of 1.83m (6ft) above the debris. The highest lintel has been removed to allow access into the cell, the doorway to the passage being at present impassable without crawling. The existence of the lintels riding over the domed roof of the cell implies that an upper gallery once ran over it. This guard cell has a very unusual feature in the form of a low doorway at its innermost end communicating with the central court; it must emerge well below the present level of the rubble there. The left doorway leads from the entrance into a space which is hard to identify; a flash photograph taken with the camera held in the entrance suggests that it is part of a long gallery. In 1909 it was described as “small and low, and a hole in the back of it suggests a connection with something beyond” . This “something beyond” appears, as noted, to be a ground level gallery. Further clockwise along the wallhead from this opening are several long stones aligned radially to the broch and tipped downwards and outwards; they should be the dislodged lintels of an upper, not a ground level, gallery since they are well above the exposed chamber over the main entrance. At 8 o’clock is the top of a huge intra-mural domed cell capped with lintels; its curved end can be seen just clockwise from this point and in the opposite direction it doubtless narrows to the lower ground level gallery which connects with the left doorway in the entrance. In 1909 the top of a stairway was said to be visible opposite the entrance, at 12 o’clock . Further clearance has evidently taken place since then which shows that what the Commission saw was probably not a stairway but the remains of the lintelled roof of the passage leading to the stair, at 11.30 o’clock. A short length of the neatly built inner wallface of the gallery containing the stair stands above the rubble from about 12-1 o'clock, and immediately anti-clockwise of this are the lintels referred to. The stair must be still hidden below rubble and many steps of it are likely to be preserved. The clearance has also revealed, just anti-clockwise from the gallery lintels referred to and at about 11 o'clock, the massive lintel of the doorway from the stair to the central court and, to the left (anti-clockwise), the almost blocked opening into what must be either the stair-foot guard cell or another length of ground level gallery and which still has its lintelled roof. 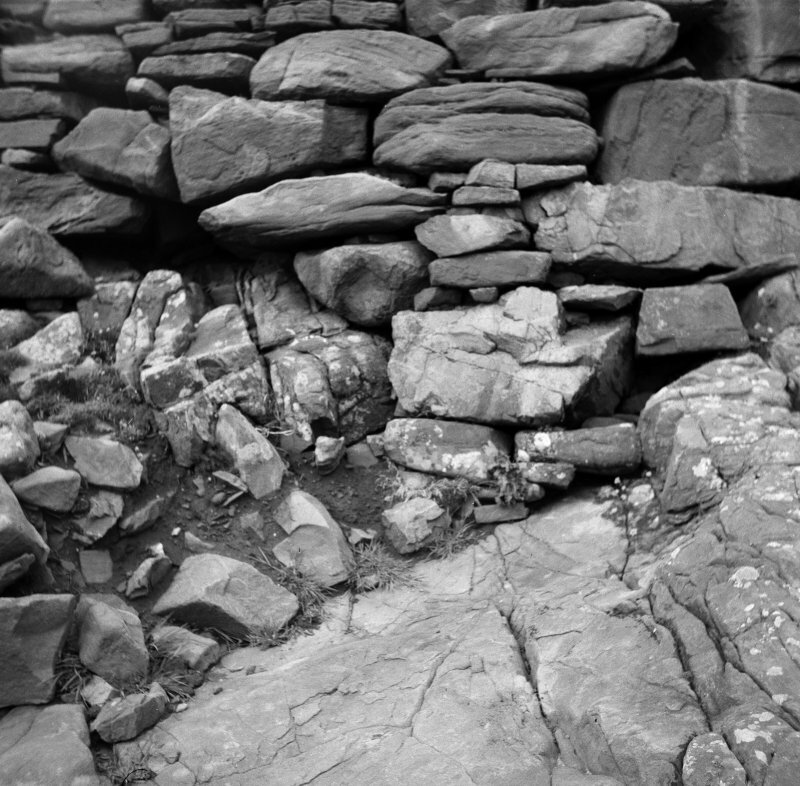 An inspection of this last might reveal whether Clachtoll is a ground-galleried or a solid-based broch but it is inaccessible at present. The stair door (its inner end is invisible under the rubble in the central court) appears to be about 1.2m (3.9ft) wide and the even longer sandstone lintel bridging its visible end has – not surprisingly – cracked in the middle. A cubical block of stone is now jammed between this slab at the crack and the earth and rubble debris some 20cm lower down. This may somehow have been inserted recently but it is possible that it may be the top of a pillar put in to hold up the fractured lintel while the broch was occupied in the Iron Age. An outer defence is visible at the base of the knoll from the south-south-east round to east and consists of a single heavy stone wallface – built of massive blocks and boulders. Presumably it was intended to make the base of the rock knoll impassable. It only partly surrounds the broch on the landward side and is as little as 3m from it on the south; this distance increases to 7m on the east. Since the broch itself was built practically on the rocky foreshore it seems unlikely that this outer wall ever completely surrounded it, unless the sea was significantly further out two thousand years ago. As it runs towards the north, and towards the line of the broch entrance, this wallface, as noted, lies further away from the broch and becomes a turf-covered stony bank about 2.4m (8ft) thick and walled on its inner face; no doubt this changed appearance is the result of dilapidation. An outer gate-way isin this 'bank', more or lessin line with the broch doorway, and is 1.8m (6ft) wide with some stone uprights flanking it. Two huge blocks form the outer end of each side. Another stone wall 90m (100yds) from the broch was thought by the Commission to be part of the outer defences, but Feachem considered it more likely to be a farm wall of a much later date . A secondary external extension has been added to the broch entrance passage but the exact details are obscure because of the covering rubble. The extension curves outwards to the left or east for about 6.0m (20ft) but only the east side is visible beyond about 3.0m (10ft) out, and the upper part of this looks like modern re-building. There is a gap in this east wall about 1.8m (6ft) out and the masonry curves back towards the broch wall, forming a wedge-shaped block; it may be the south side of a doorway leading to outbuildings. 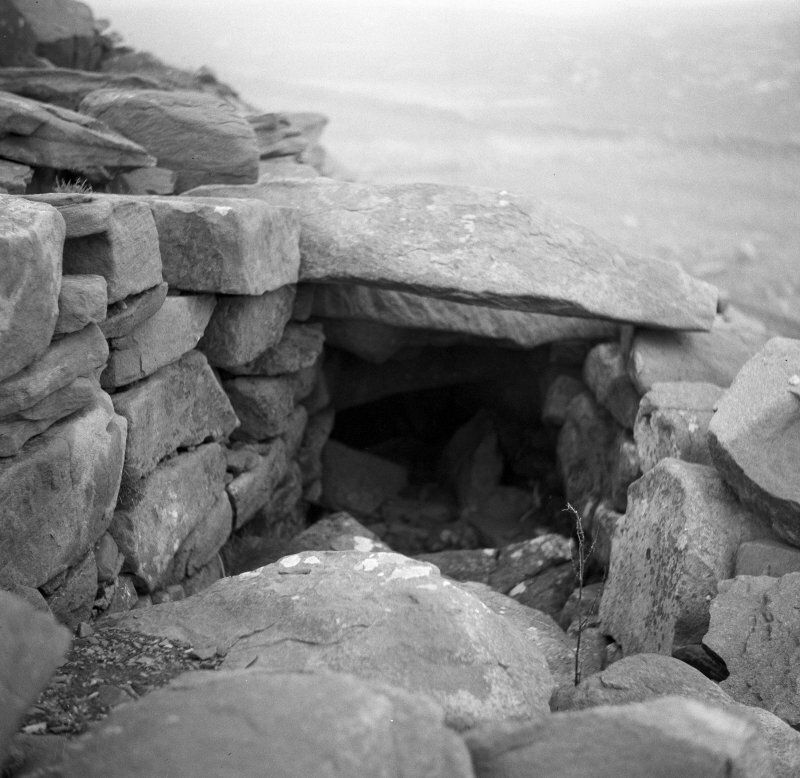 A single lintel still spans that part of the secondary passage closest to the broch, which may well be an added, secondary door-frame, though any checks are invisible. 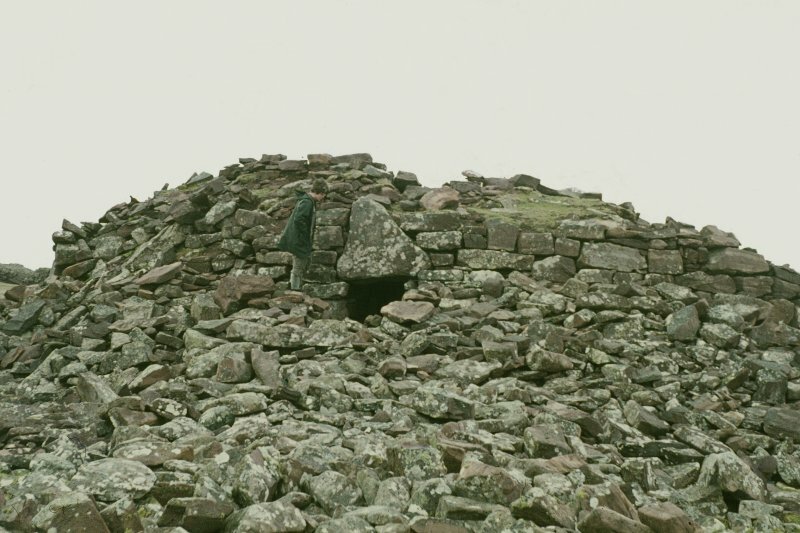 Similar structures can be seen at many other brochs. Level I: although part of the ground level storey has disappeared much of the surviving wall contains galleries and chambers. These include the right-hand guard cell and, left of the entrance, a length of gallery which may expand into the high domed cell at 9 o’clock. Further round at 11 o’clock is the door to the stair with a gallery or cell running anti-clockwise from it for an unknown distance; the stair runs upwards in the opposite direction, and it is conceivable that the ground level gallery continued beyond this right round to the guard cell (although nothing is visible among the rubble at the end of the wall). Level II: a fine ledge scarcement of Hebridean type runs round the interior at an unknown height above the primary floor and marks the beginning of the first floor storey. The scarcement at 4.30 o’clock is at exactly the same level as the top of the lintels covering the entrance so the innermost of the latter (hidden under rubble) doubtless forms part of the ledge. The chamber over the entrance is clear but no upper gallery joins it; it was thus entered only from its inner end. The rows of dislodged lintels in the southern and south-western arcs could well have fallen from the roof of the wrecked first floor gallery and the inner wallface of this is clearly preserved between 11 and 12.30 o’clock. The two cells in Level I appear to project upwards into the Level II gallery. The guard cell has a roof of stepped lintels and the tall chamber at 8.30 o’clock has the apex of its roof above scarcement level, which is doubtless also the level of the lintels roofing the ground gallery. A steatite cup or lamp was found in a recess in the wall of the guard cell to the right of the entrance “many years ago” by the Rev. J. M. Joass of Golspie who still had it in 1909 . It is now in the Dunrobin Castle Museum (for some reason the author did not draw this cup when he saw it in 1989). in 2005 the author found a battered fragment of what appears to be the lower stone of a discoid rotary quern of sandstone among the rubble on the wallhead on the southern side. As with the shattered upper quern-stone found at Dun Osdale (NG24 3) this fragment seems most likely to have been thrown into the wall core when the broch was built. In this case it would have been used in pre-broch times. The quern is now in the Ranger’s hut nearby. Dimensions: theinternal diameter (now known to have been taken above the scarcement) was originally measured as 9.6m (32ft) ; a new surveyin 1988 found the radius of this to be 4.78 +/- 0.08m, giving a diameter of 9.56 m. The scarcement is about 30cm wide so the diameter of the central court at ground level should be about 8.96m. Most of the external diameter is about 18.0m (60ft) if the walls are 4.2m (14ft) thick as reported ; the wall proportion is therefore approximately 48.5%. Sources: 1. NMRS site no. NC 02 NW 2: 2. RCAHMS 1911a, 2-3, no. 7: 3. Feachem 1976, 174: 4. Young 1962, 185 and Illus. V, no. 3: 5. Close-Brooks 1986, 150 (Illus.). NC 0366 2784 Historic Assynt with the assistance of AOC Archaeology Group undertook a comprehensive survey of the parish of Assynt in the winter of 2009–10 as part of their Assynt’s Hidden Lives Project (DES 2010, 86). 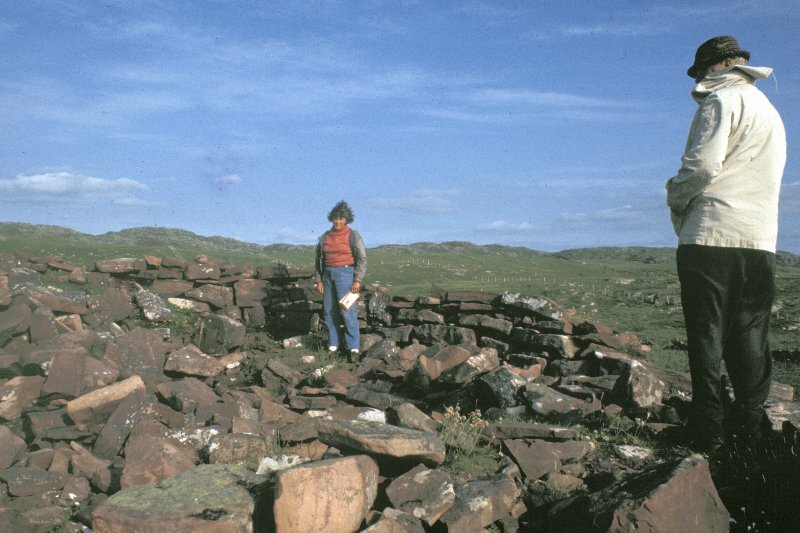 From this survey they identified three sites on which to focus their attentions during the Life and Death in Assynt’s Past Project of 26 September–7 October 2011: Clachtoll Broch, Glenleraig and Loch Borralan East Chambered Cairn. 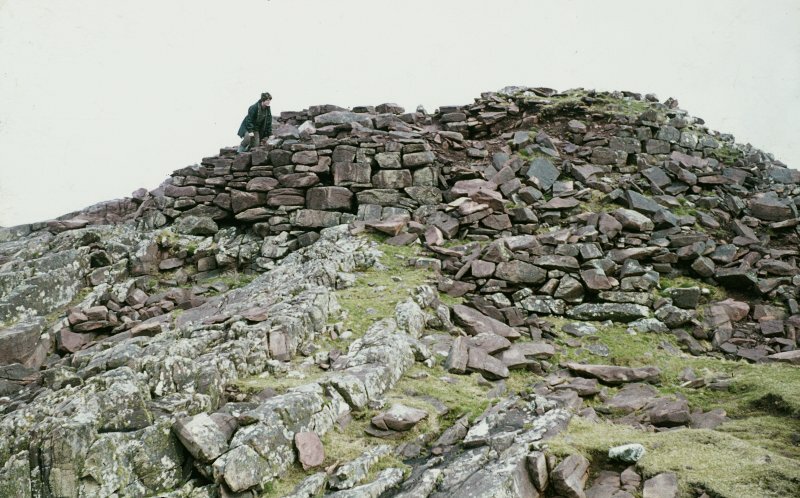 Concerns had been raised previously about the condition of the broch at Clachtoll and in 2002, HS had organised an emergency intervention in the area of the entrance. Whilst this work addressed the immediate threat to the monument, the instability of the entrance area was not remedied, and the upper inner wall at first floor level was in imminent danger of collapse. In addition, the uppermost slab of the right hand guard cell had been removed, weakening the structure of the guard cell and allowing the ingress of people and debris. As part of the 2002 works, a pillar (of red Syenite) had been introduced to support a cracked lintel. Over time this had become unsightly and ineffective and was found to be hanging by its fixing from the damaged lintel, as the stones on which it had been supported had settled away from its base. Conservation works began with the excavation of material to the left of the entrance which had slipped downhill and was eroding back into the wall fabric. This revealed the intramural gallery of the first floor wall level, now infilled largely with wind-blown sand. Iron Age pot sherds were found at the base of this infill, resting on the upper surface of the in situ deposits of the gallery floor. The gallery provided compelling evidence of the structural failure of the entrance area at some point in time. The debris slope toward the front of the outer wall and c3m left of the entrance passage, continued behind the poorly constructed wall face at this point. There is no doubt that the inclined slope of structural stones from the inner face of the outer wall continued and continue to exert pressure on the outer wall skin. To counteract this force, a new block of masonry was erected from the horizontal level to which our excavation had proceeded (roughly the level of the bottom of the entrance lintels). This was designed to withstand lateral forces from the entrance area and to buttress the outward lean of the inner wall and adjoining debris slope. All newly placed stones were marked with two 5mm modern drill holes so that on close inspection the new can be distinguished from original or authentic fabric, while at the same time the holes are not detectable from more than a few metres away. The area above the entrance passage was stripped out down to the level of the tops of the lintels. This material was mainly backfill from the 2002 incursion and its removal revealed the bronze armature used to support the most seriously damaged of the lintels. We did not disturb this arrangement. The excavation revealed the existence of a ‘lintel pocket’, a space within the wall into which the lintels had been dropped. Stub walls had been built over the lintels’ ends the W one still intact, the E example had been removed in 2002 and the space it had occupied was rebuilt into the adjacent wall, masking its existence and function. We concluded that the stub walls were intended to carry at least a second layer of lintels, relieving the stress on the primary lintels. We had anticipated some such relieving structure but, in the absence of any record from the 2002 intervention had only the evidence of the surviving stub wall to support this interpretation. It had been our intention to provide long term relief for the passage lintels by inserting secondary concrete lintels above them. The structure revealed allowed us to dismiss this approach and to insert replacement secondary stone lintels to achieve the same end. AOC's stone conservator replaced the stone pillar with a steel plate and stainless steel dowels under the end of the split lintel. Suitably textured and coloured epoxy resin was used to secure this support and to mask its appearance sufficiently to reduce its visual impact. Stripping of the inner face of the upper wall adjacent to the entrance revealed the scarcement first noted by Dr MacKie, which was revealed over several metres on the W side of the entrance passage. The scarcement was constructed by the simple expedient of moving the upper wall inwards c350–450mm from the inner face of the ground floor wall. Each of the stones revealed had on it a deposit of carbonised material and many of them were broken. It is clear that they were fractured by the collapse onto them of large structural stones. Within the broch interior a mass of vacuous structural stone could be seen to underlie the current solum. This mass is interpreted as primary collapse of the broch wall in this area. A sample from the carbonised material has returned a radiocarbon date of 2025±30 years BP. Calibrated, this indicates that the wood sample dated had ceased growing at some date between 111 cal BC and 55 cal AD (with a probability of 95%; or between 53 cal BC and 22 cal AD with a probability of 66%). This date can be described as implying the cutting of this wood near the end of the 1st century BC. The damaged wall to the E of the entrance passage at first floor level was stripped down and laser scanned at intervals to compile a continuous record. It became clear during the work that virtually every stone in this wall segment has been fractured. Using the largest surviving fragments together with new material from among the loose slabs within and around the broch, we rebuilt this wall, restoring it to a vertical profile, especially along the side of the entrance passage, which it had come to overhang dangerously. Finally, the gap over the guard cell was closed off with stone lintels and a large stone slab. The latter was dowelled into the adjacent roofing slab of the guard cell; the only direct intervention into the in situ fabric of the monument. This in turn was buried under a further layer of large stones, to deter vandalism and soil was introduced to the wall head. This soil will be topped up and returfed in the spring of 2012, when the weather is more clement and the turves may have a hope of surviving and establishing a grassed over wall head. The broch at Clachtoll stands on the elevated rock outcrops above the shore at the S end of the Bay of Stoer and is enclosed by an outer wall extending around its landward flank. Embedded in a mound of rubble, the stump of the broch measures about 9.7m in diameter within a wall up to 4.2m in thickness and in places 3m in height. Its architectural features include mural chambers, guard cells, a mural stair, a scarcement, an upper gallery, and a checked entrance with a bar-hole slot. At a later stage the passageway at the entrance, which is on the NE, has been extended outwards in what must be the arrangement of access leading from the entrance through the outer wall to both the broch and other structures. The outer wall is between 1.2m and 2m in thickness, but expands into terminals 4m thick to either side of the entrance, though this may be a development of the passageway leading to the broch. It encloses an area measuring about 45m from N to S by up to 26m transversely (0.1ha), most of the seaward flank being sloping bare rock; the whole of the southern end is covered with rubble from the broch, which occupies this end. The relationship between the broch and the outer wall is unknown. footing consolidated by installing a concrete plinth dowelled to the bedrock, and reinstated in its original arrangement. During the rubble removal, it was observed that the collapse debris within the broch was semi-structured, suggesting that the majority of the rubble related to the collapse of the upper parts of the broch tower. There was little evidence that this debris had been disturbed since this collapse. Deposits relating to the use and destruction of the broch were encountered and excavated. On exposure of the scarcement ledge, a thick deposit of charcoal, primarily comprising small roundwood and similar to that which provided a date of 2025±30 BP (SUERC-36728) during previous works (DES 2011, 96–7) was encountered. This layer of burning was found to be extensive across the interior parts of the broch, and many of the stones of the internal wall showed evidence for heating to high temperatures. It therefore seems probable that the interior of the broch was burnt on abandonment; further 14C dating will be undertaken to establish with confidence the date of this event. The charcoal layer was sampled on a grid in order to assist with the analysis and interpretation of its composition. quadrant, a clay floor contained a knocking stone or mortar, full of carbonised cereal grains suggesting that it was in use at the time of the conflagration. The floor deposits themselves comprised wet organic clays, interleaved with bands of peat ash, probably representing hearth rake-out. the first floor landing. In clearing rubble from the ruinous S broken wall end prior to stabilisation and consolidation, the remnants of a further intra-mural gallery were exposed, suggesting the presence of a further gallery in the original ground floor plan of the broch on the W side. Within the interior of the broch, compensation for the steeply sloping bedrock by the builders of the broch has resulted in the construction of a curving passage, reminiscent of a souterrain, formed by a lining wall in front of the bedrock and the inner face of the broch on the E side. This lower space was floored with flagstones; a rotary quern was found lying at its base. A large artefact assemblage was recovered from the excavations, including numerous finely carved stone lamps or cups, c50 finished and unfinished spindle whorls, rotary quern stones, strike-a-lights, a complete antler weaving comb and fragments of others, bone pins, iron pins, a complete copper alloy ring-headed pin and a sizeable assemblage of decorated ceramics. A range of iron objects was also recovered, including a probable axehead, though most await identification. The large animal bone assemblage included representation of a range of domesticates as well as cetacean, seal and red deer. The post-excavation analysis programme is now under way.